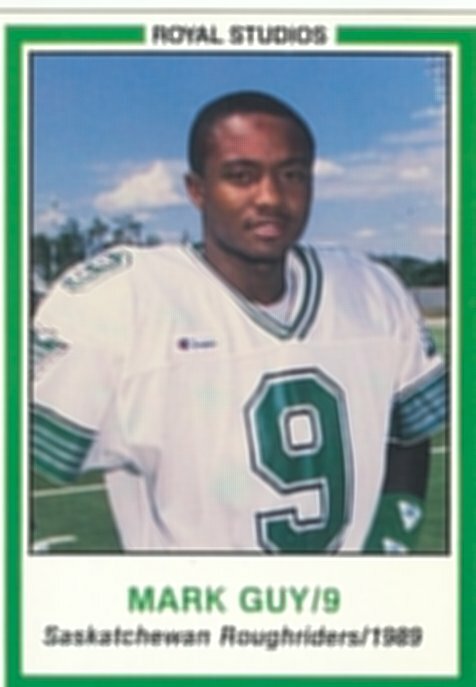 The speedy wide receiver signed as a free agent with Saskatchewan in March of 1989. Guy didn't see a lot of action in that rookie season (7 games and 10 receptions), but he did dress for the 1989 Grey Cup game where he caught 4 passes for 100 yards as the Riders won their second Grey Cup in franchise history. Guy saw more action in 1990 (12 games and 23 catches), but was released by the Riders in March of 1990. Calgary signed Guy as a free agent in June. Guy had a fairly productive 7 games with the Stampeders, as he had 16 catches and 29 punt returns for 401 yards and a very good 13.8 yard average.